Do you work for VeriShow? Help desk for small business, $25/month. 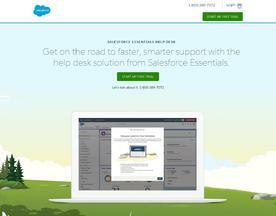 Salesforce Essentials is a customer support app built on the #1 CRM. It allows you to provide multi-channel support, improve agent productivity and deploy a self-service help center. Make decisions from reports that give you CSAT, response time and more. TeamSupport helps simplify communication and understand your customers better. Fully customizable, better visibility, and built for business to business to help you solve customer issues faster and improve the customer experience. Try us free today!